I’ve written about chili a number of times. There’s my epic vegetarian chili which is free of meat and full of flavor. 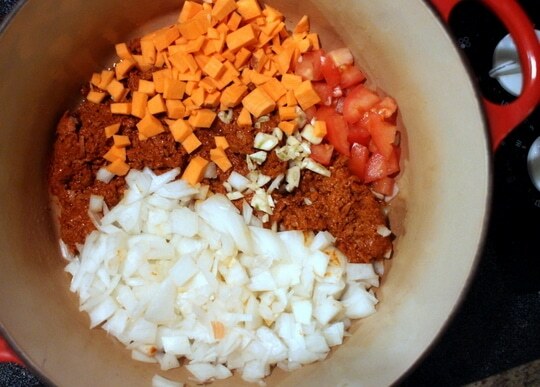 If you’re more traditional there ‘s my chili con carne recipe (and I even share my secret ingredient). 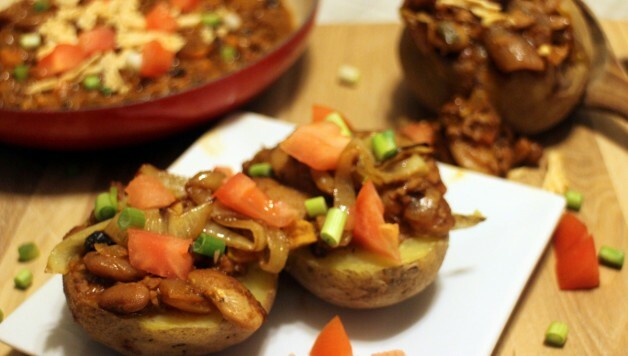 Today’s chili is something of a hybrid of the two and it is the ultimate baked potato stuffing. 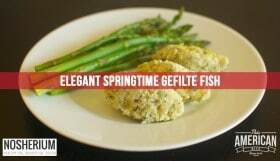 Today’s recipe is also this month’s Kosher Connection roundup. 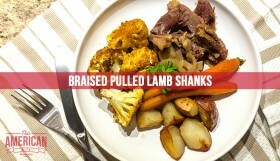 Each recipe submission is something that would be perfect for a Superbowl Party. I was in New York for the Kosher Food and Wine Experience for last year’s Superbowl Sunday and this year, it’s going be a busy day as I’m organizing #PhotowalKC in the morning and attending a Super Bowl party in the evening. 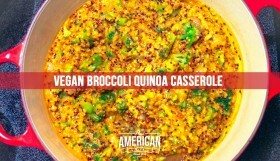 This dish is the perfect make ahead dish as the the flavors really develop and taste even better the following day. Another bonus… this is much better than spending the game frying wings while all your buddies are in front of the game. 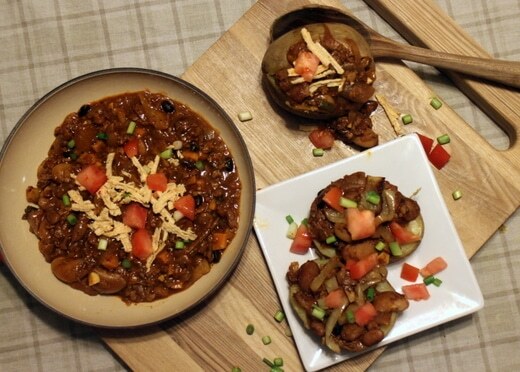 This chili recipe was originally inspired by the soyrizo chili I found at Budget Bytes but you’ll notice that I mixed it up a little made it my own. 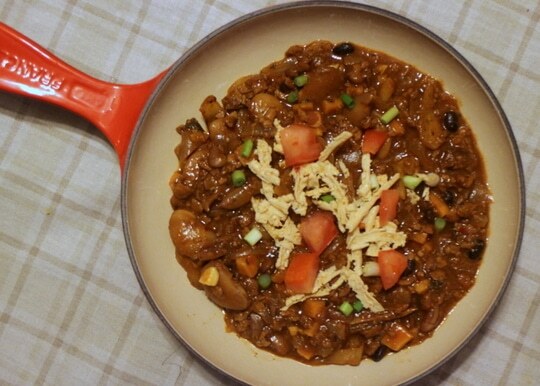 Each ingredient has a great deal of flavor that combines to make a filling a meaty chili even though it’s vegan. A lot of the flavor comes from vegan chorizo sausage, also known as soyrizo. 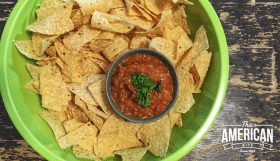 You can make your own soyrizo with this recipe, or you can buy it at Whole Foods, Trader Joes or here (if you’re on a kosher diet, check the package for your preferred kosher symbol, not all soyrizo is kosher). The other way this differs from the typical chili was my choice of bean. Rather than using a single bean I jumped at the chance to use all the random beans I had in the bottom of mason jars. On their own, I couldn’t have made much but when I combined the mung beans, kidney beans, butter beans and lima beans I had, there was a great bean mix for my chili. I don’t recommend the butter beans, they were too large and the skin sheds when you soak the beans and need to be removed before you cook with them. Most bean mixes will work for this so use your favorite. Chickpeas or red kidney beans a great combination for chili too. 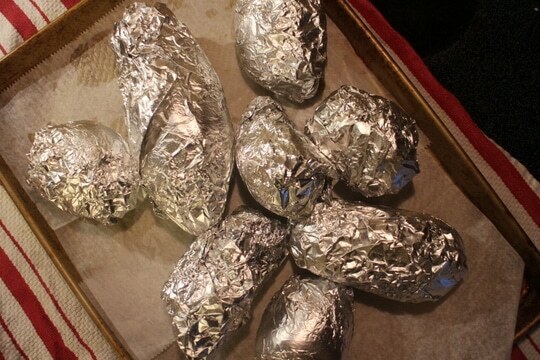 The perfect baked potato can take time, so start on these 90 to 120 minutes before dinner. Wash each potato to remove any dirt on the skin then piece the skin of the potato a couple of times by stabbing each one lightly with a fork. If you want an extra crunch on the potato skin, drizzle a little olive oil on the outside of the potato then wrap each one individually. 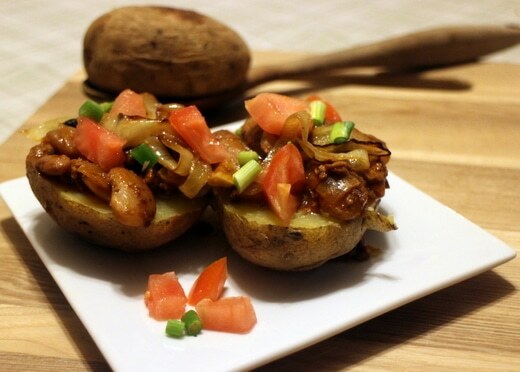 Pre heat the oven to 425 degrees and cook until you can insert a paring knife through the potato with ease. For the scientists, use a meat thermometer to check the internal temperature, when it reads 210 degrees F, your potato is cooked. 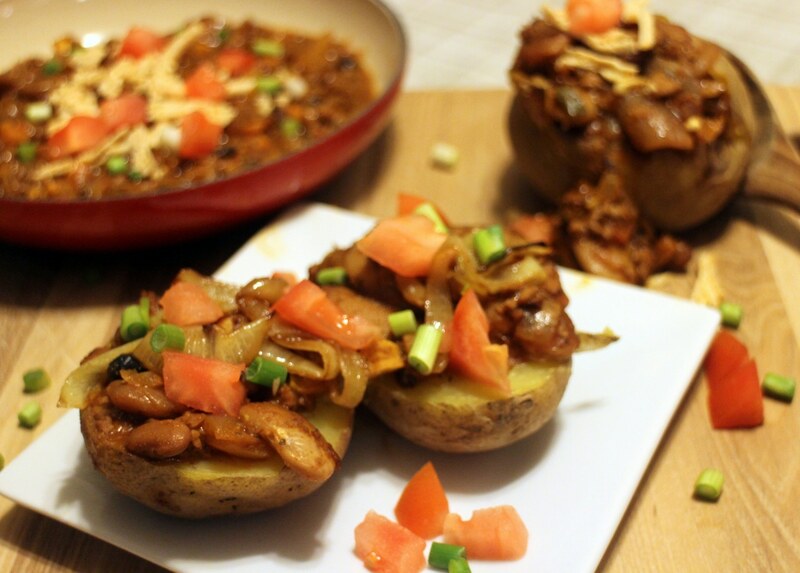 If you made the chili ahead of time, put it on a low temperature to reheat while the potatoes are cooking. If you’re making it from scratch, you can keep this on low once it’s cooked. Heat your large skillet, braiser or dutch oven. Cast iron cookware works well as it will heat and cook evenly (and I am obsessed with Le Creuset!) Dice your onion and let it start to sautee. Add other ingredients, except for the beans. Stir occasionally until the onions are soft. Stir and add the cooked beans. Add 1 – 2 cups of stock, stir and cover. Cook on a medium temperature for 20 minutes so it’s bubbling gently. If you are serving the same day, you can leave this on a very low light to keep warm until you serve it, or allow it to cool and set in the fridge overnight for the flavors to marry and serve inside baked potatoes.